Personalize in style with our outdoor-friendly, virtually unbreakable Drinkware. 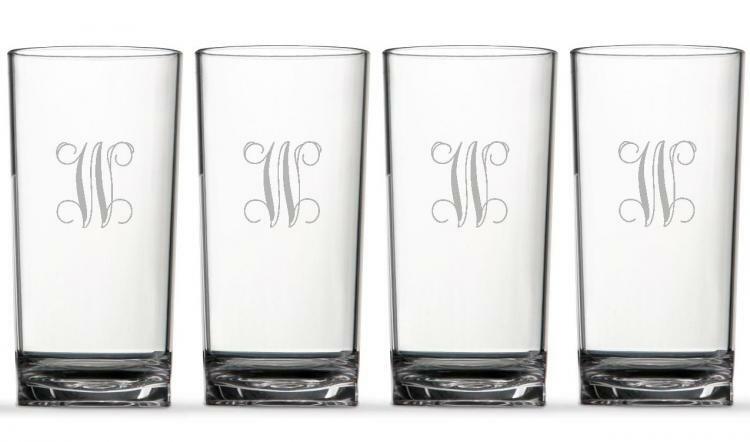 Set of 4 simple yet stylish 16 oz Classic Coolers (Highball Glasses) is a great choice for everyday drinkware. Coordinates with our Classic Pitcher. Unbreakable is dishwasher safe, made in USA, and BPA FREE! Each Cooler is 6.25" tall. Imagine personalized beverageware that is virtually unbreakable, yet luxurious - uncompromisingly durable and clear at the same time. Price: $74.00 In stock! - Browse this brand: Carved SolutionsOur products are custom made to your specifications. This product ships up to 2 weeks after your order is placed.